The never-ending march for a better world. 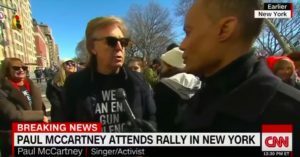 With those few simple words to a reporter asking why he was participating i n the recent gun control demonstrations, Paul McCartney not only perfectly summarized his intention, but also managed to unite the generations of people marching with him and remind us that you’re never get too old, or secure, to aspire for a better world. 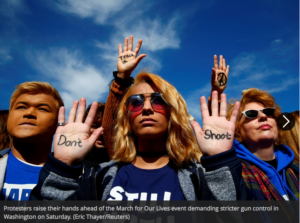 He was participating in one of many demonstrations taking place as part of the “March for our Lives” movement staged last week in many American and Canadian cities. 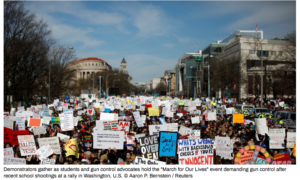 Responding to the Parkland Florida mass shootings and so many that have gone before, millions of young people took to the streets to demand action from their political leaders. The sight of these folks, many of them really just children, publicly and boldly prodding their leaders to action was inspiring and one of the most hopeful developments to come from our southerly neighbours in some time. But among them were also many not-so-young people, spurred on by their own convictions and reminding all that there were older people among those lost in the shootings at Marjory Stoneman Douglas High School, and that gun violence is indiscriminate, targeting all. The “best friend” Mr. McCartney referred to was, of course, John Lennon, who was killed by a gunman outside his New York apartment in 1980. 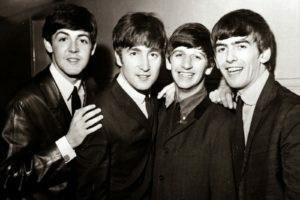 Together with George Harrison and Ringo Starr, they formed the Beatles, the group which transformed the music world in the 1960s and, many believe, were key contributors to a massive social movement that influenced an entire generation – a generation that engaged protest and became quite familiar with marches and mass demonstrations. What I recall from that time, and still persists for me today, is firstly how revolutionary their music was. Because their songs are now so familiar to us, it’s difficult to appreciate today just how fresh and original they were at that time. They really didn’t sound like anyone else, and didn’t fit any particular pre-existing style. They wrote all their own songs, which was apparently unheard of for a group of young people at the time. Their harmonization and musical instincts seemed like uncomplicated, pure perfection. For those who were young at the time and searching for an identity that distinguished them from previous generations, they provided the perfect vehicle. They brought hope and the sense than true change was possible. Over the years, particularly for those of my generation, their music still evokes that sense of optimism and promise that a better future is always achievable. The other aspect I recall is their incredible irreverence. They were amazingly unpretentious, unapologetic and in no way intimidated by convention. They were audacious and genuine. I recently watched a documentary about them featuring film footage of interviews with seasoned, much older reporters who were completely unprepared for their refusal to condescend and were completely incapable of controlling the interview. Told that a music critic felt their music had “unresolved leading tones, a false modal frame ending in a plain diatonic”, John responded “he ought to see a doctor about that”. Asked the meaning of their group’s name, John said “it means Beatles, doesn’t it? But that’s just a name, like shoe”. Their rejection of convention, and refusal to be drawn into values not their own, was remarkable. Over fifty years later, that spirit seems secure in the young people marching and speaking out last week, and in Mr. McCartney’s willingness to stand with them. It should remind us that issues such as gun control, climate change and social justice transcend age and generational stereotypes. It should remind those in positions of authority that the young people of today may indeed have concerns worthy of attention and are not really so different than they were. It should remind us all that young people have the considerable advantage of seeing the world through fresh and optimistic eyes, not yet worn down by the weight of responsibility and prior disappointments. They simply want a better world and ask “Why not?”. Didn’t we all? Shouldn’t we all? Don’t we all? As I write this, one of my favourite Beatles discs plays in the background. I linger on the lyrics and plaintive melody of “All You Need is Love”. 3 thoughts on "The never-ending march for a better world." Would have been a fun med school interview. John, what shoud we do about access to MAID? “All you need is love man”. How do you resolve conflicts in a group? “He who shouts loudest.” Time will likely show as that these radicals will stand with the other greats that were ahead of their time, Bach, Beethoven, Mozart.